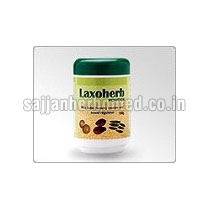 Laxoherb Powder is indicated in Ayurvedic treatment of acute and chronic constipation, gaseous distension of abdomen, floating, hyper-acidity, piles, fissures, indigestion, flatulence and heart burn. It balances Vata and Pitta at the level of stomach and intestines. It can be taken for upto 1 month, based on doctorâ��s advice. 1 teaspoonful of Laxoherb Powder at bed time with luke warm water, or as directed by the physician is recommended for adults. In a very high dose, it may cause purgation. Children, pregnant ladies and lactating mothers should take this medicine only under medical supervision. One should store Laxoherb Powder in a cool dry place. We are enlisted among the reputed Suppliers of Laxoherb Powder from Punjab, India. Presentation : 100 grams in a plastic jar.